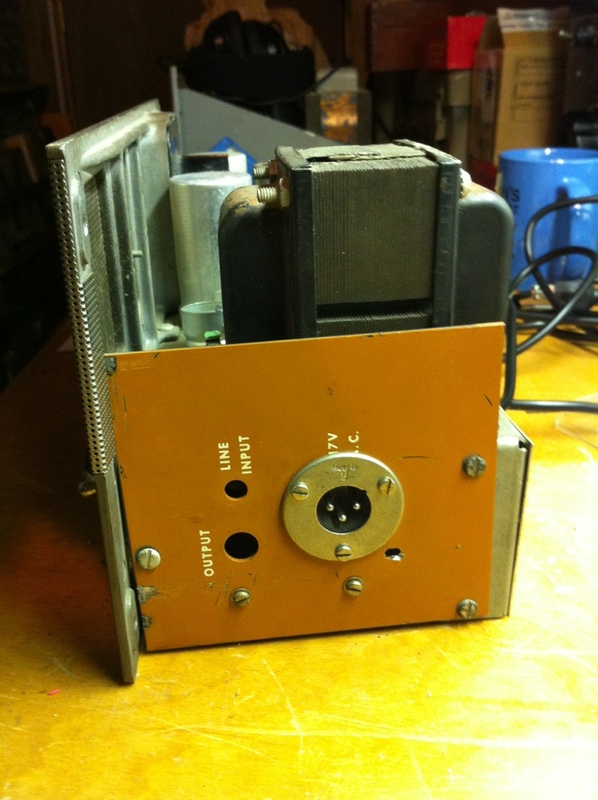 A client gave me a beautiful original Gates Sta-Level to bring back to life. It had all original components but had not been turned on in over ten years. 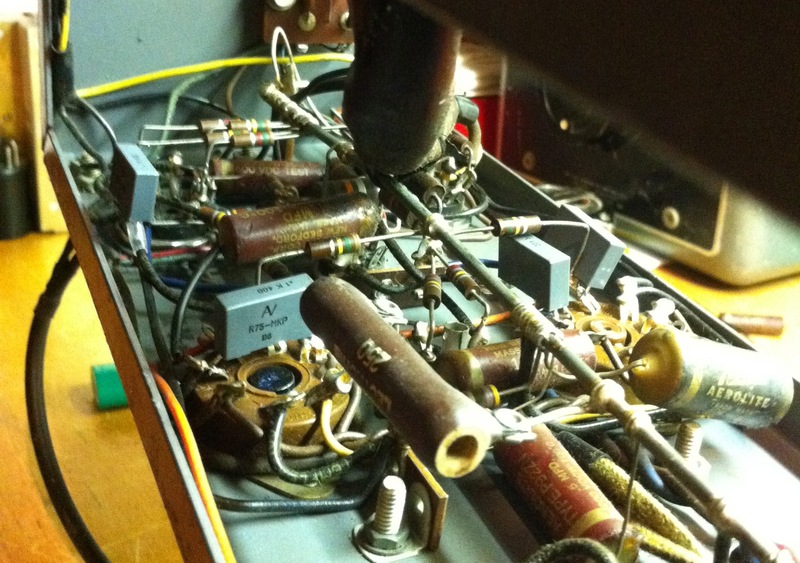 After testing all the tubes, I brought it up on my Variac with just a solid state rectifier installed. The power supply filter caps were good, but not great so they got replaced first. With the new PSU caps and the tubes installed the unit was working ok, but had a very strange frequency response. Above 1kHz it was fairly even, though not quite up to spec. Below 1kHz it increased steadily to about +12dBm at 30Hz! It turned out the feedback caps from the 6V6 output stage to the 12AU7 were leaky. I replaced those and the coupling caps and things are now back to factory spec. The guts – dead stock! Not a lot of great pictures this time, but something I do get requests for. 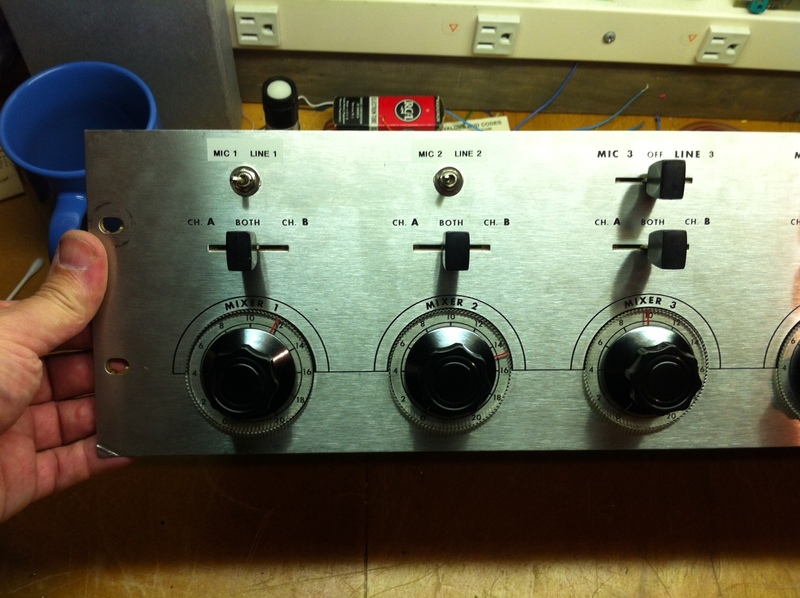 There are quite a few nice tube mixers around that sum two or more inputs into a single output. 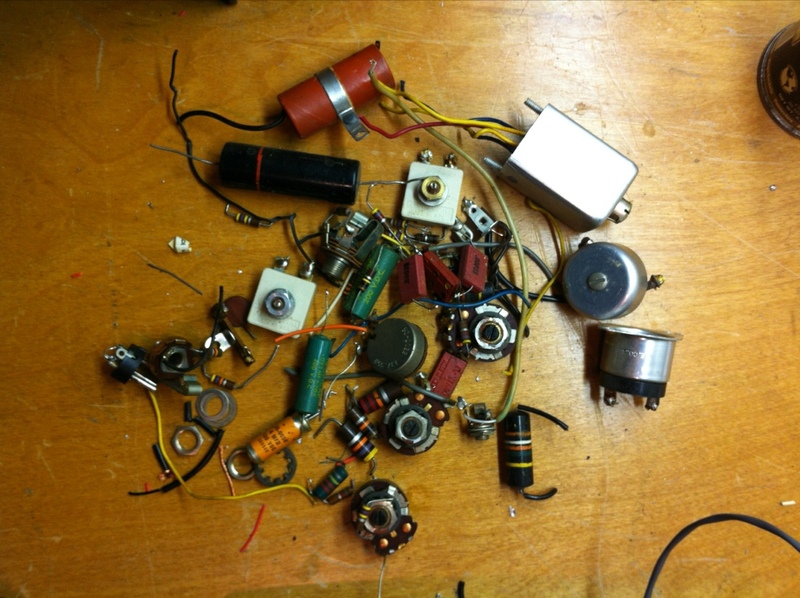 Often folks would like to use these as individual mic preamps with their own outputs. Your only choice is to use them as a single channel pre, or add some sort of direct out. 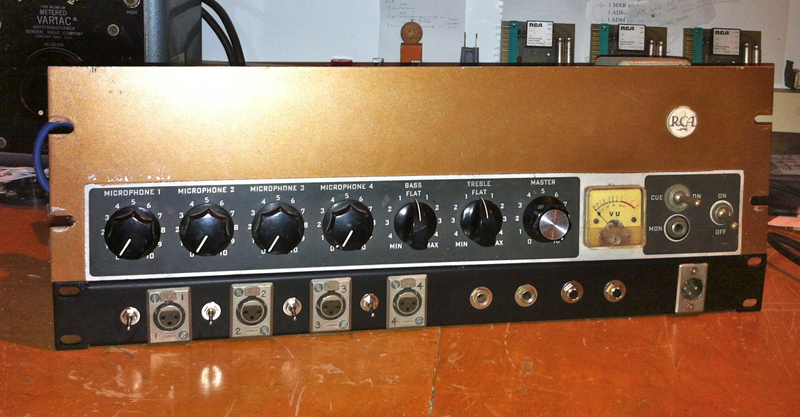 The issue is that these preamps use a single tube (or half of a dual triode) to amplify each input, then one or more tubes for EQ and output stages. 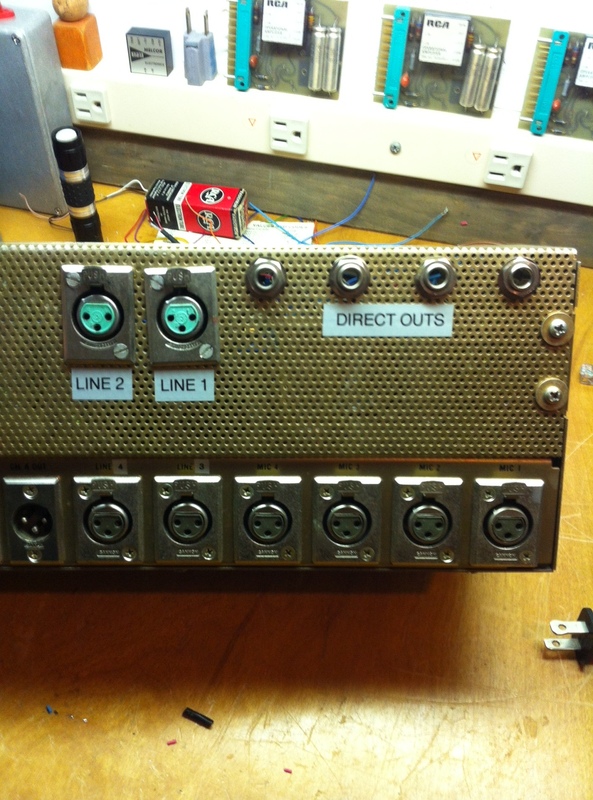 Of course it would be costly to add identical output stages to each channel, even if the power supply could handle it. 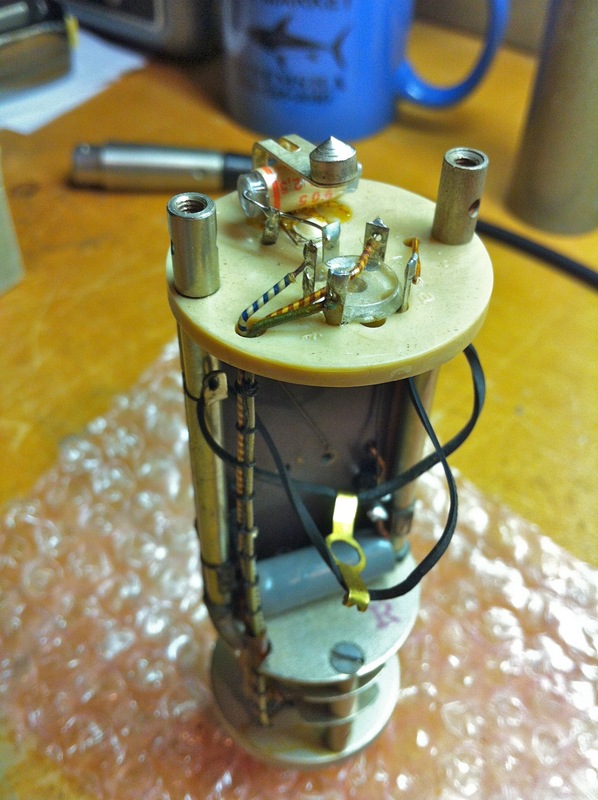 So the quick and dirty method is to take an unbalanced signal right off the coupling capacitor from the first stage. The downside is that these outputs can’t drive much of a load, and have a reduced level compared to the main outs. The upside is that they generally work well into the high impedance inputs of most converters and other modern gear. Also, by using a switching jack, the signal can be connected to/disconnected from the mix buss automatically. I have done this recently with a vintage RCA mixer (MI-C38690) and an Ampex MX-35 and both clients were quite pleased with the results. The RCA also got input pads and a nice panel for all the connectors as well as some power supply cleanup. 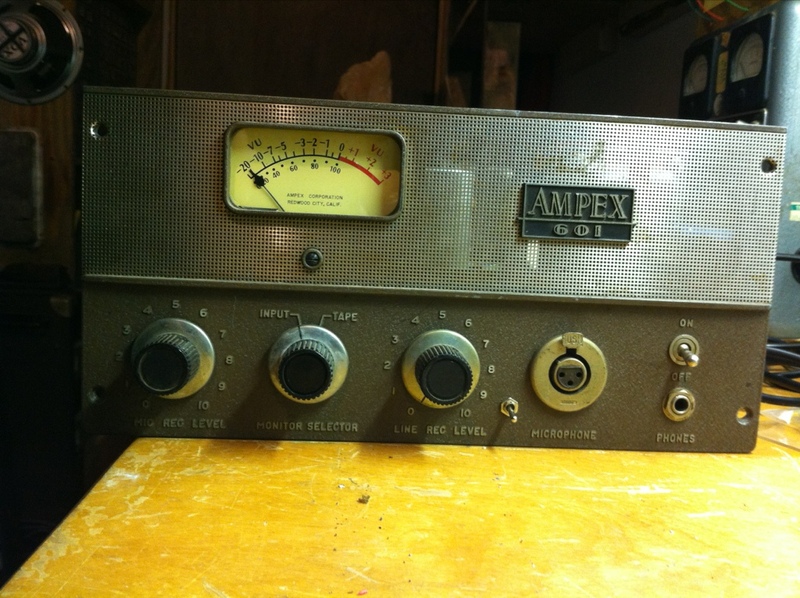 The Ampex was additionally modded with line inputs on the first two channels. 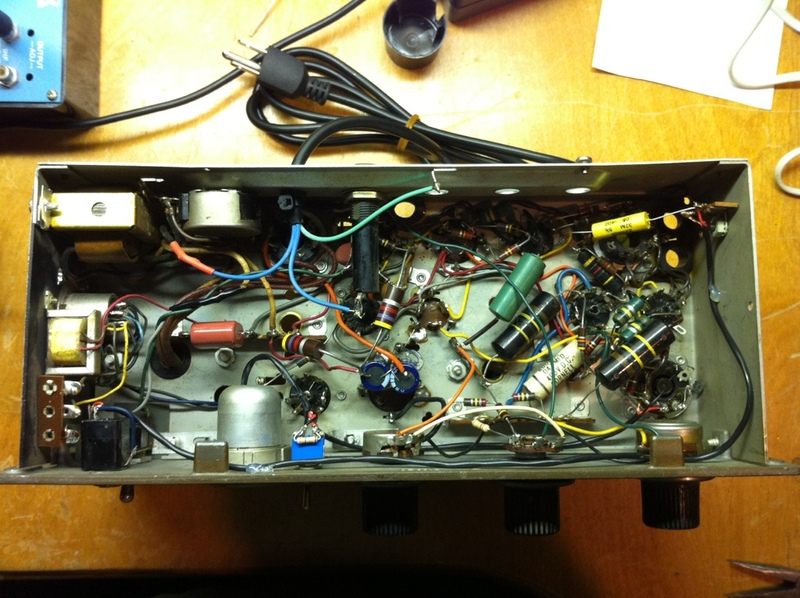 This was a fun project that involved removing some tape deck electronics and modding the remaining circuit into a tube mic preamp with DI. 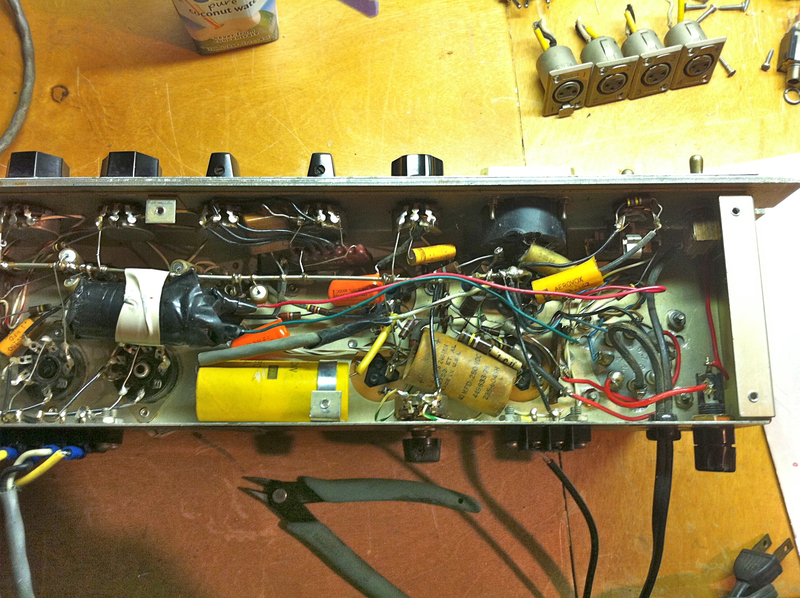 As you can see, several of the tubes are not needed when using this as a preamp. A whole bunch of other parts came out too which cleaned up the crowded underside of the chassis a good bit. The headphone jack is now the DI input and the Input/Tape switch selects either the mic or DI. 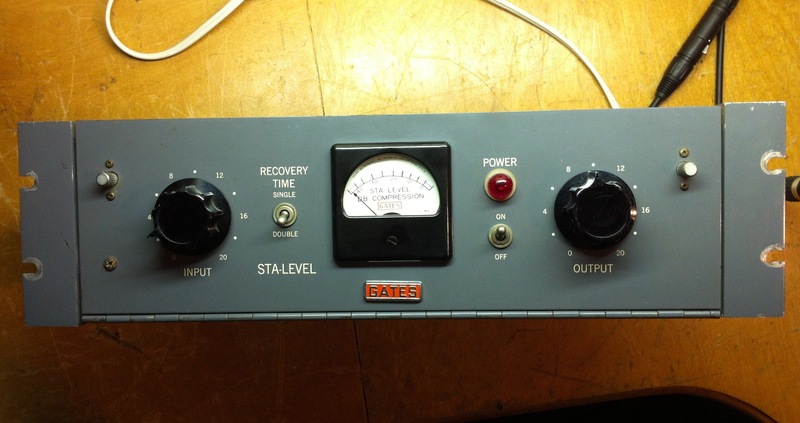 The Line Rec Level pot is now the DI level control and an XLR output jack has been added on the side. 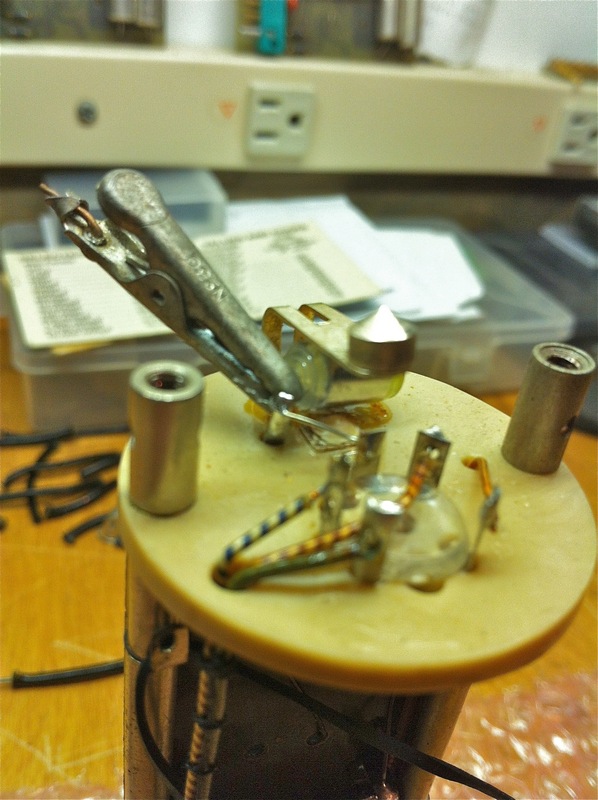 Removing the transformer takes a lot of disassembling. The original and the Sowter replacement. Sowter soldered up and ready to install. 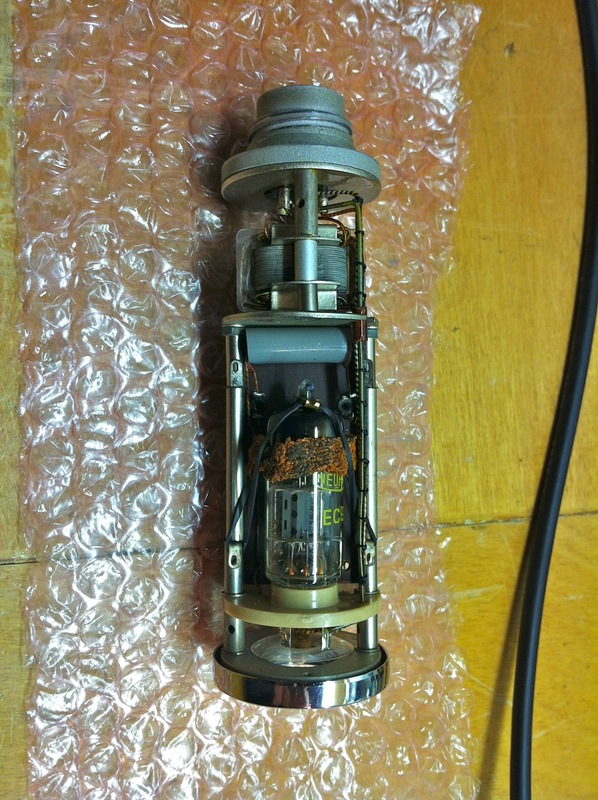 This is a rare Telefunken V72S – the “S” is a higher gain version. 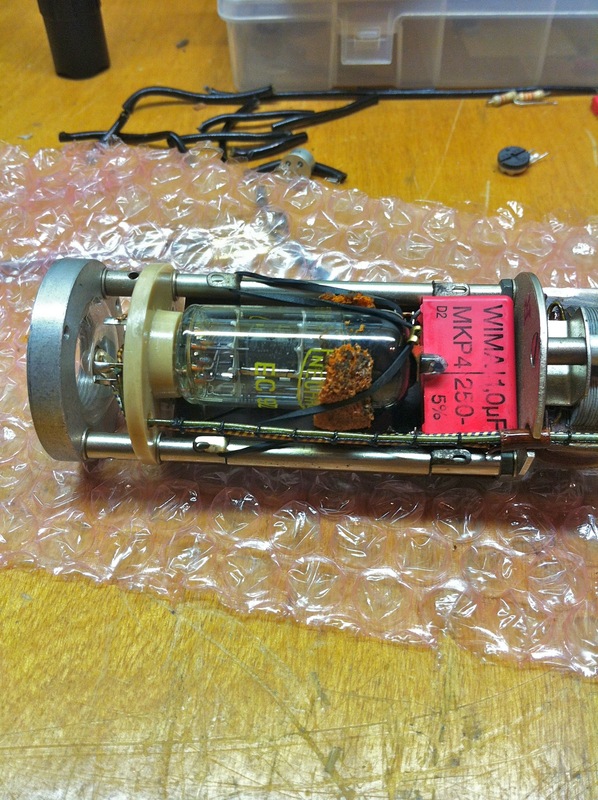 Unfortunately this one had a bad input transformer. The frequency response of the transformer looked like this: / A rebuilt original was too costly for my client, but Sowter offers a replacement that works just fine. The hard part is removing the original and mounting the new one! 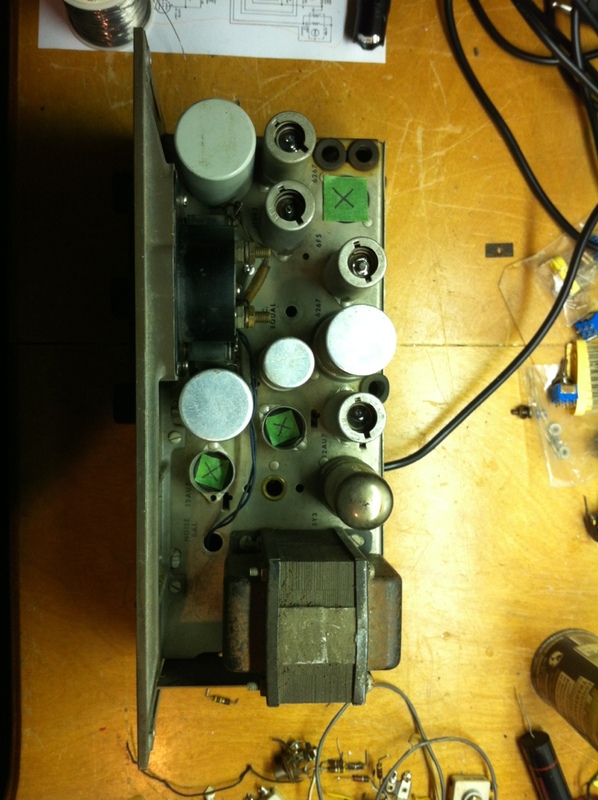 Front view with gain control knob. 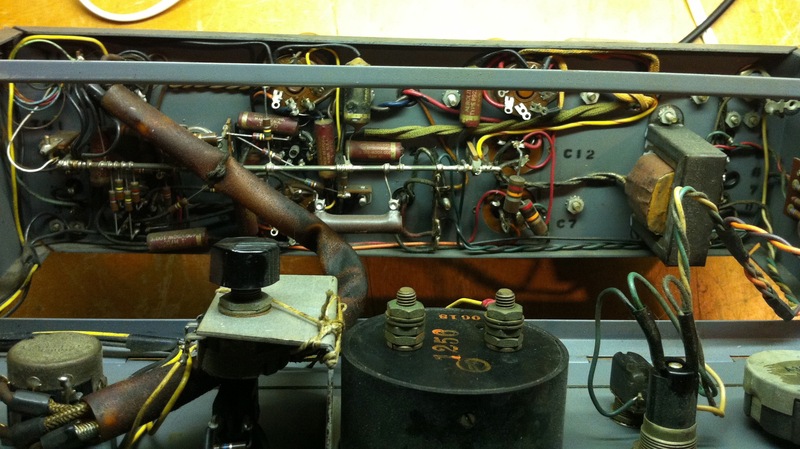 Inside, the original wiring was so nice! Here you can see the replaced power transformer. 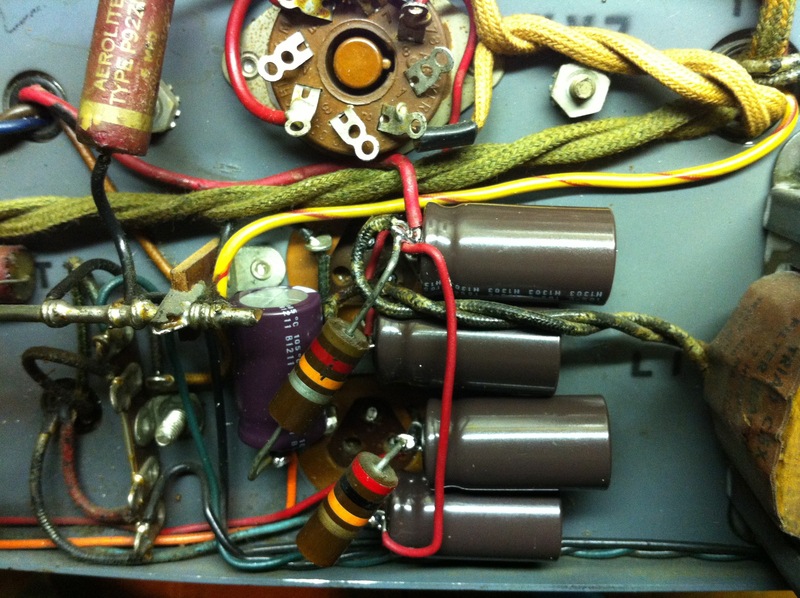 This vintage RCA vacuum tube preamplifier was missing it’s power transformer. Fortunately I had the schematics and a transformer that would fit the bill. A couple power resistors were required to get the voltages spot on, but in the end it worked out well. 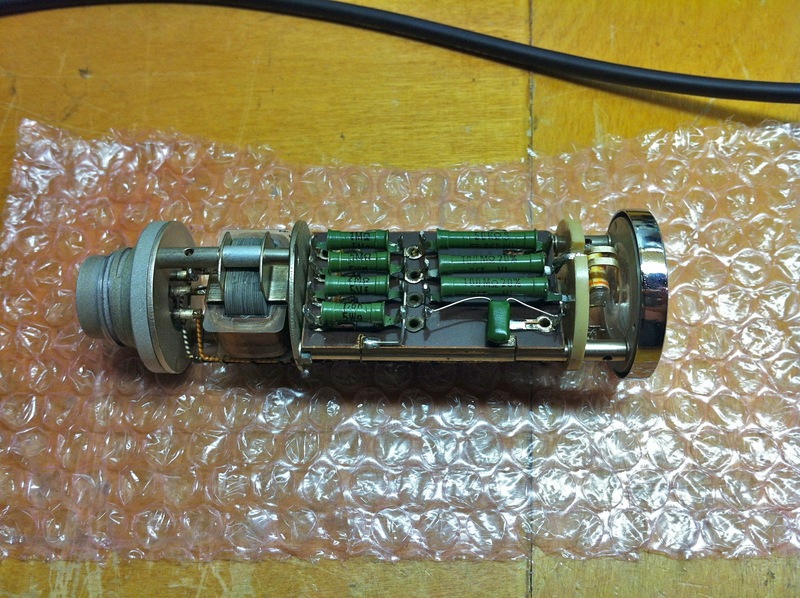 The unit got a full re-cap and a fresh set of New Old Stock vacuum tubes. The new owner even received an original manual!